Civil war in Yemen has been ravaging the country for three years. Houthi rebels have been engaged in bitter and bloody conflict with the Yemeni government. But it’s not just them – Saudi Arabia has been backing the Yemeni government with substantial, violent military power. But instead of containing conflict, it seems Saudi Arabia, with the help of the U.S., has been blindly dropping bombs in Yemen, and its nnocent, uninvolved civilians are paying the capital price. According to UNICEF, 75% of Yemen’s population relies on humanitarian aid to survive. But it is being cut off from civilians because of blockades and import restrictions. The bombings and fighting have led to devastation: infrastructure providing water, food, and health services has been destroyed; the salaries of millions of civil servants have been salaries cut off; Yemen’s children are out of school and dying in the streets of starvation. Intense bombing and lack of funding has left half of all health facilities in Yemen shut down or in ruins. Each day, hundreds of desperate patients flock to hospitals that are severely understaffed and drained of resources. The U.S. has finally moved to stop fueling Saudi Arabia’s warplanes that are bombing Yemen. It is unclear how much impact this will have, or how the U.S. will move to expand humanitarian aid to Yemen’s civilians. It seems that the public has been ignorant of Yemen until the murder of Saudi journalist Jamal Khashoggi turned a more critical eye on the actions of the Saudi government. Still, children like 7-year-old Amal Hussain are suffering for a conflict that is far beyond their control. The New York Times published anecdotes and pictures of families and their children “pushed…to the brink of starvation” by the Saudi-led war. Father Ali al-Hajaji lamented that skyrocketing food prices meant that he could barely afford a piece of bread. He had already lost one son to starvation, and his 3-year-old son was barely holding on to life. Amal died in a refugee camp a week after the article was released, just as an unimaginable number of children are meeting needless death. 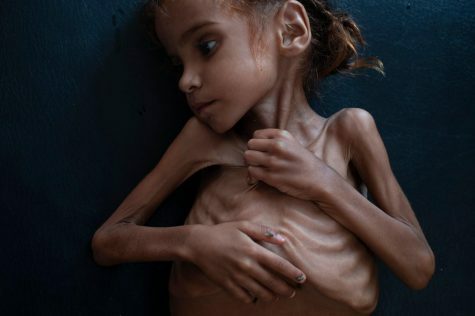 U.N. humanitarian chief Mark Lowcock gives an alarming report that in Yemen, “We may now be approaching a tipping point, beyond which it will be impossible to prevent massive loss of life as a result of widespread famine across the country”. The innocent and powerless are bearing the brunt of a war they have no connection to. If you wish to send help, The International Rescue Committee, Save the Children, Doctors Without Borders, and Unicef are among the nonprofits still working in Yemen.